Which if you're working with multiple files from a network location, can quickly become an annoyance, this is due to Windows incorrectly classifying a local network location as being in the Internet Zone. You will now be able to access all files without the annoying pop-up! Where is Control Panel on Windows 8? First of all - Where on earth is the Control Panel in Windows 8? A few ways you can retrieve this, first of all the easiest method is to simply start typing Control Panel when on the Windows 8 Start Screen (or Metro Screen if you wish to call it that) this will then show you the option. to get the updates out of the way - nothing worse than being stuck at work at the end of your shift, waiting for the Windows Updates to finish on shutdown! Just a quick tip, regarding an issue I came across myself recently when trying to launch Still Life 2, every-time I launched the application the screen went black and the monitor turned itself off. My initial thought was the video driver, however the solution turned out to be one that people overlook all the time, update your Monitor driver! A lot of the time when setting your monitor up with your computer it will automatically be recognised as a Plug and Play monitor or Generic Plug and Play monitor, which may be fine, however if using this generic driver the system is not always aware of what resolutions your monitor can and can't handle, in the case of Still Life 2 it was attempting to launch in a resolution that my monitor couldn't cope with so my monitor just turned itself off. A quick trip to www.iiyama.com to download the latest drivers, and hey presto the game launches without issue! Have you been a victim of software piracy or knowingly installed a Pirate version of Windows 7 and seen the light? Recently I've been having a play with Linux, namely Ubuntu. I've found it really easy to use, there's loads of free software available, and the set-up is really simple - I would advise anyone to give it a go (I will provide a how-to guide on this in the near future). And that's it! You can now connect via RDP from any Windows machine! You don't have to spend a fortune on software for your PC/Laptop, in fact there's a massive selection of software available out there for free, some even offer really good alternatives to the popular paid-for software. 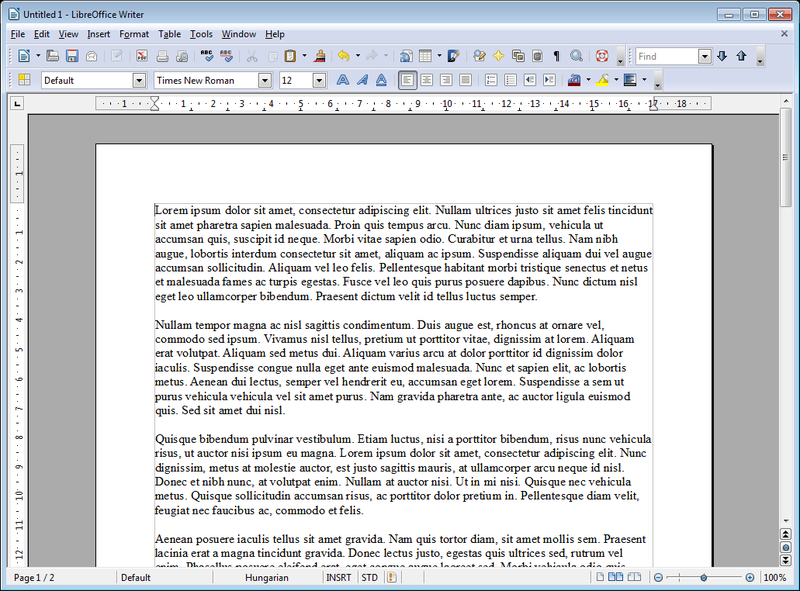 First up we have LibreOffice, an excellent free alternative to Microsoft Office, it can open all of the usual Microsoft Office Formats and includes an equivalent to each of the Microsoft Software programs, LibreOffice Writer instead of Microsoft Word, & LibreOffice Calc instead of Microsoft Excel for instance. All are laid out very similar to the their Microsoft Counterparts, so it's not going to be a huge learning curve if you're used to the Microsoft equivalent. Forget the myth that you have to pay to get a decent anti-virus, there are some excellent free security packages out there, that do just as good a job as the paid-for software, you only have to look at the independent reports published on AV-Comparitives to see that some even outperform the paid-for versions. One of the best I've found is Avira Free Antivirus, doesn't hog system resources and like any good anti-virus you only have to know its there if you need it! The free version use to have a slightly annoying nag screen when you initially logged onto your machine, they do however appear to have removed this in your latest version. According to AV-Comparitives they have a very high detection rate, and indeed I've been running this on my home machine for years and never had any issues. Avira do have some paid-for versions on their site, but unless you feel you may need the extra functionality, you should find that the free verson does everything you need it to. 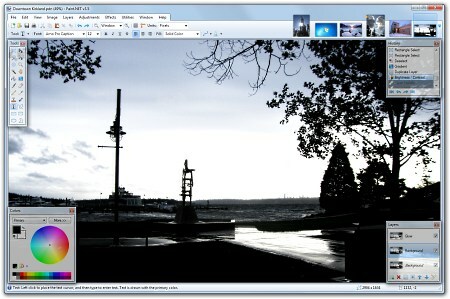 Everyone's familiar with Paint that's been bundled with Windows for what seems like forever, and people are also familiar with software like Photoshop, but Paint.NET seems to be an excellent mish-mash of the two, , it's an excellent photo/graphic editor, and let's you play around with layers, transparency and best of all it's completely free! Originally designed as a student project as a simple replacement for Microsoft Paint, it now does significantly more, and that the original developer now works for Microsoft, so you can only assume they were impressed with his work! Dropbox if you are not familiar with it is a cloud storage service, that I so wish had been around when I was at university! If you're not familiar with the concept it's basically like having a hard drive or usb stick that you can access anywhere you have internet access, whether it's on a laptop, on your smartphone, computer in the office etc etc you get the idea! If you install their software, it basically appears on your computer as another drive - so you can copy and paste what you need. Obviously if you install this on other computers the drive is there for you too! So the days I was at university and realised I'd forgotten by USB Drive and had to go all the way home to pick it up, If I'd only had Dropbox! Dropbox also have Apps available for iPhone, iPad, Android, Windows and Mac. You can also find add-ons to synchronise with Google Docs etc too, so loads and loads of options out there! It's also really useful if you want to share a file with a friend, you can pass on a special Dropbox link where they can download but not edit your file. 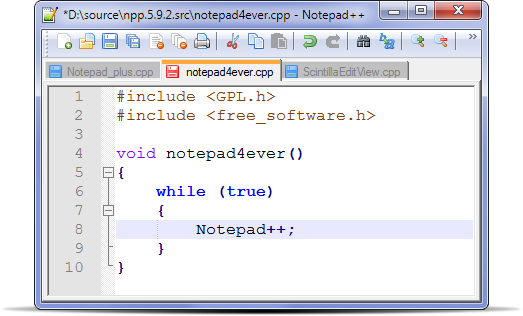 A fantastic little program, that I couldn't live without nowadays - as you've probably guessed is designed as a replacement for Notepad, I use it myself both as a Notepad (duh!) and also for editing code/viewing logs, either way this adds a heap of features that you will wonder how you lived without them! Simple things like tabbed pages make navigating between opened files easily, where it comes in to it's own though is the search facility, say you are analysing logs and want to look for certain keywords and how often they appear - you can highlight them all and in proper context to what's around it, making it a very powerful little program. 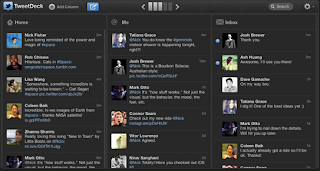 Lots of us stay in touch with the world now using Facebook, Twitter, and a multitude of other social networks, but lots of us don't want to waste time checking each one for updates, and then spending more time sending the same update one by one into each network - This is where Tweet Deck comes in. Tweet Deck allows to you to view what's going on in each of your social networks, and send the same update (if you so choose) to all of your social networks in one go! You can also schedule Tweets, customise whats Tweets/Facebook updates etc you do and don't see and loads more. 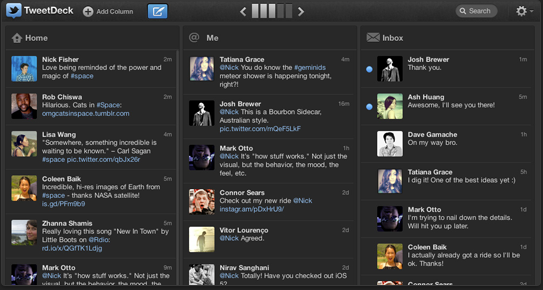 Tweet Deck is available on Windows, Mac, iPhone, iPad, Android, it's even got it's own App in Google Chrome, so it really is available everywhere! The Windows built-in defragmentation utility does do it's job, but let's be honest it doesn't do it's job particularly well, it does a long time, seems to constantly re-start and you can't really customise it for what you want it to do. Defraggler is an excellent free defragmentation utility, it works quickly and just does a wonderful job sorting out your hard drive, it even has a quick defragment option for when you don't have much time. Defragging the hard drive is something we should all be doing on a regular basis to keep things working as efficiently as possible, but not many of us seem to do it anymore. Audacity is an excellent free audio editing software, useful for trimming down those files and particularly useful if you want to trim down tracks in your MP3 collection to use as ringtones! It's extremely easy to use, allows you to record live audio, take your favourite sound files and mix them together to make some beautiful (or less beautiful) music! You can even change the speed and pitch of your recordings. It includes built-in effects to add Echo etc to your sound files. Quick tip - Microsoft have released 23 updates this week on Microsoft/Windows Update. You might want to get them out of the way now so your not stuck with the dreaded installing 1 of 23 when you come to shut down at the end of your work day! And that's all there is too it! IPv6 is now turned off for this connection. 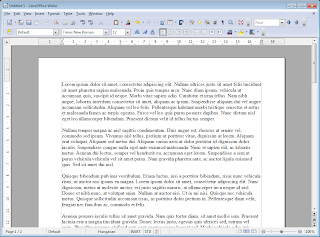 By default Office 2010, when opening files originating from the Internet or perhaps deemed as unsafe will automatically be opened in Protected Mode, whereby you have to click Enable Editing to make any changes/edit the document. 4. Untick the ‘Enable Protected View’ options where you do not want this to automatically apply. Unless you've been living under a rock you'll have heard the buzz regarding Windows 8, the new operating system coming out from Microsoft that attempts to ditch the usual start menu/desktop and use the Metro interface as seen on Windows Mobile and the Zune. They've recently released the consumer preview so that you can give it a go and see what you think of the new operating system, however for obvious reasons you might not be willing to upgrade your entire computer to the new OS, so how to try this out? 1. First of all you'll need to download the Windows 8 Consumer Preview - head over to http://windows.microsoft.com/en-GB/windows-8/iso and download the iso file for the version of Windows you have on your machine (either 64 or 32bit, you can check this my right clicking Computer and choosing properties). 2. Next up head over to the Virtual Box web site and download and install the latest version. 3. Open up VirtualBox, and choose New > Next to open the Create New Virtual Machine wizard. You’ll be prompted to give the Virtual Machine a name, Windows 8 or Win 8 Consumer Preview would be two of the obvious choices! And from the drop down boxes choose Microsoft Windows as the Operating System and Windows 8 or Windows 8 64 Bit depending on which you are installing. 4. Click Next, and using the slider choose how much RAM you would like to allocate, a recommended guide would be 1024mb for the 32 bit version of 2048 for the 64 bit version. 5. The next three screens have default options that are perfectly acceptable, so choose next through these (these are for the Hard Disk, Default VDI format and Dynamically Allocated). 6. Next you choose the hard drive space you’d like to allocate, at least 16Gb for the 32 bit version of 20Gb for the 64 bit version. 7. Now Click Create – Your Virtual Machine is now installed, but we’re not finished just yet – it’s time to set-up Windows! 8. After selecting your VM, go to Settings and Storage, click the disk icon and select ‘Choose a Virtual CD/DVD disk file’ and point to the ISO File that you downloaded earlier (with the Windows 8 installation). 9. Next up choose System in the list on the left, and click the Processor Tab, ensure that Enable PAE/NX’ is ticked and Click OK.
10. That’s it! Just click Start and this will load up your Virtual Machine, the first time you start this you will go through the Windows 8 set-up, so just follow the dialogues as they appear on screen, but you can now have a play with Windows 8 to your hearts content and it’s all separate from your main computers environment. Enjoy! So you've just set-up your new PC, you've got your software installed, but are you sure you've not forgotten anything?, have you installed any Anti-Virus? Or worse still, has your anti-virus trial run out, still installed and no longer protecting you machine unless you pay the obligatory fee? Just remember a good anti-virus is essential for protecting anyone that uses your PC, but also crucially important for protecting anyone you may (or have) communicated with. Viruses that spam all of your Hotmail contacts and Facebook friends are on the rise,so ensuring that your machine is adequately protected has never been more important. But of course in the current financial situation, we're all trying to cut costs, but that needn't mean cutting corners, there are a variety of free anti-virus solutions out there that can be just as effective as their paid-for counterparts. Well Microsoft tried to unleash a paid for product in the past with Windows Live Onecare, sadly this was never very successful for them, however their free product launched back in 2009 is taking the world by storm, very lightweight, with excellent detection rates and you would expect the people who make your operating system would know how to be protect it. Again a very lightweight product with high detection rates, the only drag regarding this piece of software is the nag screen that pops up each time you update the virus definitions, this screen doesn't appear in the paid for version that they offer, but again only a minor annoyance, and if you search heard enough (Google is your friend!) there is a registry edit you can make to stop this nag screen from appearing. AVG is one of the original Kings of the free antivirus, however in recent years they have been dogged by claims that the detection rates are not as good as the competition and that the software can be rather bloated. They are however still well worth considering. These are just 4 reputable free anti viruses available on the market, more are available, but all go to show you don't have to pay for reliable anti-virus protection. 11. Your file type should now be unblocked in Outlook. This has now enabled the functionality, typically designed for OEM's to put their mark on the operating system. 4. Place a JPG file in the folder that you wish to use as your background, the file will need to be less that 256kb and will be stretched to your screen resolution, so best to use a picture in the correct ratio that matches your screen resolution. That's it :-) the screen should now appear whenever you are on the log on screen (why not lock your machine now to see the results!). Delete config.xml and stylers.xml file in this folder. 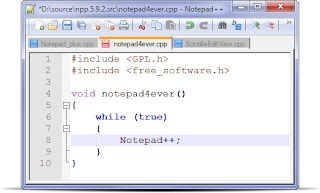 Re-open Notepad++, the files will be re-created and the program will open normally.